Created by our Executive Chef, Neil Nugent. Liven up leftover Christmas pud. Preheat the oven to 200C, gas mark 6. Break up the Christmas pudding into pieces and mix with the cream until smooth. Spoon into a piping bag with a straight nozzle. Lay out the pastry sheets and pipe a cigar-sized line of the pudding mix lengthways along the middle of the pasty. Fold over the pastry lengthways and roll into a cigar shape. Place on a baking tray and sprinkle with cinnamon sugar. 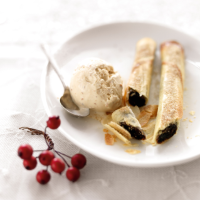 Bake for 8-10 minutes or until crisp and serve with Waitrose Mince Pie Ice-Cream.